Caravan Towing Tips And Reversing Advice - Inspired Camping. For newbies and others lacking in confidence, we’ve pulled together some caravan towing tips and advice. We’ve even got a couple of ideas on how to handle reversing, something many people find difficult. First of all you need to know the unloaded weight of what you’ll be towing. This will be in the trailer somewhere. Then you need to add your estimated cargo weight to give you a total towing weight. Then simply refer to your owner’s manual or car dealer to find out what the towing limits of your vehicle are. We were fortunate enough to get our sticky paws on the Volvo XC70 for our expedition and as the towing capacity of this car is 2100 kg we were well within limits with our vintage caravan, which weighed just 750 kg. Volvo recently displayed their vehicles towing abilities at the Caravan and Camping Show at the NEC this year so it was good to get a chance to try it out in the great outdoors when they offered to sponsor this article. Most caravans have a trailer hitch, crank wheel, electric hook up, coupler, latch and lock, safety chains and handbrake at the front. Make sure you are familiar with all of these before attempting to hitch your caravan. 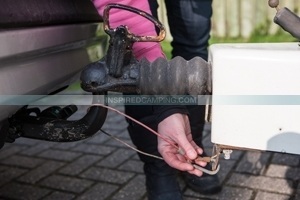 Line up the hitch ball on your vehicle with the trailer coupler on the caravan. Then its just a matter of lowering caravan by turning the crank handle. Raise the handle to release the coupler and let the hitch ball move into position. You will know when your vehicle is attached to the caravan as when you try to lift it up again the car will come with it. If you’re having difficulty attaching the caravan then hop up and down on it to make sure it’s fitted properly. Once attached, secure with the lock above the coupler and fix the safety chain. Then you need to plug your electrics in and do your final checks with the lights and load position on the road. This is particularly important if your caravan is running too low at the back, or you might leave part of it on the road when you go over a bump. Be aware when you are manoeuvring the caravan by hand into position to hitch it up, that the smallest bumps and holes in the road surface can make it move forwards unexpectedly fast. Often a caravan is wider than the vehicle pulling it so add extra mirrors to ensure maximum visibility Also be aware when driving through tight spaces what the dimensions of your load are. You definitely don’t want to remove the roof of your caravan like a sardine tin! When driving on the road its advisable to take corners wider than normal. This will make sure your caravan doesn’t hit the kerb or other obstructions at the side of the road as you travel. Move the vehicle in a slow and steady way and make sure you have maximum visibility or a helper to direct you into position… oh yes and don’t forget to disengage the reversing brake. When reversing using your mirrors turn the wheel in the opposite direction to the way you want the caravan to go. When reversing while looking out of the rear window, look over your right shoulder put your left hand at the bottom of the steering wheel and turn it in the direction you want your caravan to go. There are courses available for some extra towing training, but the best bit of advice we can give you is to take your trailer to a large area with no traffic, set up some small obstructions (such as cones) and practice manoeuvring and reversing. When you’ve reached your destination and parked, you need to chock your wheels. This helps to secure them but also helps get your caravan level on uneven ground. When secure and you’ve put the handbrake on, you can raise the caravan with the crank handle until the coupler lifts off the hitch ball. Remember to raise the lock and handle to release the coupler. After you’ve moved the vehicle forward you can adjust the height of the caravan to keep it level. A carpenters spirit level is perfect for the job. Then all you have to do is attach a wheel lock and enjoy your time at the campsite. Take a look at our recent inspiration article about Small Travel Trailers. A huge thank you to Mark, Sam and Betsy for letting us borrow their gorgeous vintage Safari caravan, to Mark Beresford for the show picture, to Roy for the towing pictures and to Volvo.